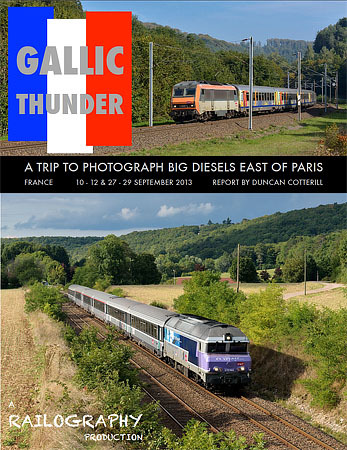 This illustrated report covers five days in France attempting to photograph big diesels on the Paris - Belfort line either side of a trip to Germany. Part of a sixth day was spent on the electrified main line west of Strasbourg. The SNCF class CC72100s are probably the last six axle express passenger diesels in Europe and are very impressive machines. Unfortunately they don't work that many trains these days and some of the trains they're supposed to work don't actually run. The Paris - Belfort line turned out to be more photogenic than expected with a number of excellent locations. The Saverne Gap, on the electrified main line from Strasbourg towards Metz, Paris and Nancy was a lot busier with plenty of TGVs, quite a few loco hauled passengers but not as much freight as I expected. The main report is in pdf format. Click on the cover image (right) or the link below to view or download it. For detailed day by day observations including loco numbers, go to the Day by Day section. This remains a set of webpages as usual.